My friend Mary was in town this weekend. Being the sweet friend that she is, she said that as soon as I had started blogging years ago, she knew it would be a great platform for me to grow my voice as a dietitian. I was so flattered! 🙂 She asked how my cookbook is coming along and the answer to that question is…splendidly! I only have 26 recipes to go! And, my publisher will not be expecting the final product until November 1st versus October 1st. Woop! So while talking to Mary yesterday I was saying how the only recipe I have to share contains meat and what ever will I do for a Meatless Monday post? I was inspired while grocery shopping (honeycrisp apples are here!) and then perusing Pinterest. I whipped up a meatless masterpiece to share. I tend to over-look the simple things in life. Yogurt + peanut butter — big whoop. It doesn’t get any easier than that. But fortunately, it also doesn’t get any more delicious that this….and I’m not even a peanut butter fanatic like some! I didn’t think it was possible for a honeycrisp apple to be anything more. But this dip takes my favorite apple up a whole notch. I am taking this to work today and I’m going to share with the cook and the kitchen supervisor. Unless they disagree, I think this will even be served in the hospital cafeteria this week. One bite and lives will be changed forever. No, seriously. Don’t roll your eyes til you try! Combine the ingredients using a whisk in a small bowl. 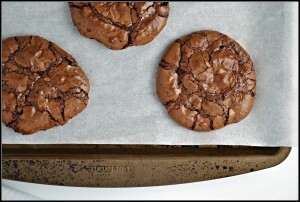 Serve immediately or refrigerate. Result: My new favorite snack, without a doubt! 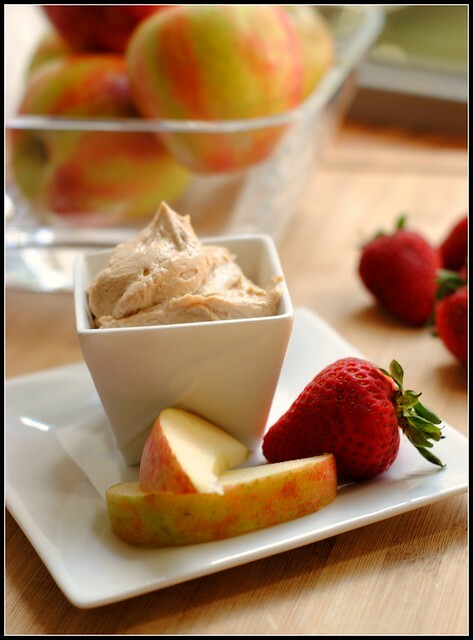 Served with a small apple, this snack comes in right at 200-210 calories and is very filling. The portion size of dip is generous because, well, you’ll probably have trouble saying no to more! Enjoy! This weekend flew by…busy week ahead! Interesting! I’ve never had yogurt + peanut butter before. I love both (and have an apple a day!) so I’ll have to try this. Seriously? It’s as simple as greek yogurt and peanut butter?! You know I love that! Too bad I still can’t eat apples. It’s the saddest thing ever. They are all coming to our produce section now, and look SO GOOD (especially the honey crisp). I guess I’ll just have to eat this with the strawberries 🙂 HAve you tried PB2 yet? It’s also REALLY good mixed into Greek yogurt! I can’t believe that this is only yogurt and peanut butter…it looks like frosting! Definitely going to be a snack soon! Super simple! This may be added to the Mr’s b-day party appetizer list! Why have I never thought of that?? Sounds amazeballs! My favorite apple is still the Fuji apple – perfect balance of sweet and tart – glad you had a great weekend with Mary! Yum. Apples and peanut butter are easily my favorite snack, but mixing the peanut butter with yogurt seems so much fancier. I’ll have to try this asap. OMG you had me at pb! Oh geez … I definitely won’t knock this because it sounds too fabulous for words! 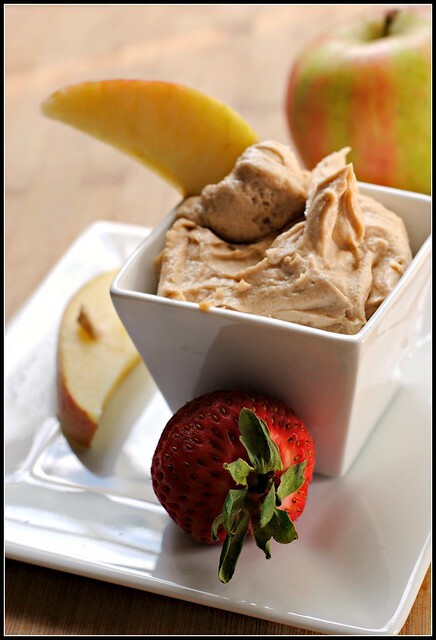 I love how this is a protein-packed version of the typical apple and PB snack, and at the best time of year, too! I make this with a strawberry yogurt – it’s like PB&J that way! My breakfast every morning is a 6oz container of plain fat free Greek yogurt with a tablespoon of sugar free raspberry preserve and 2 tablespoons of PB2 mixed in. It is heavenly and filling and overall just awesome. I’m thinking I might try the same combo in my steel cut oats when the weather gets cold and I need something warm in the morning to get me started. 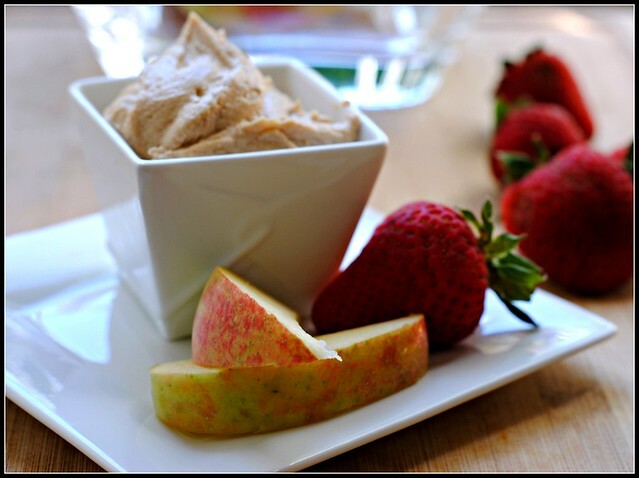 Dipping apple into the yogurt sounds like a great snack idea. My little boys will love it! Yum!! This is now on my ‘to make’ list!!! I make this for my 18 month old all the time. 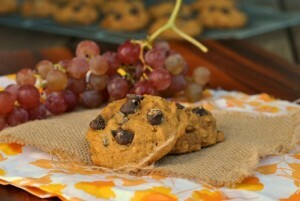 It’s a great way to get him to gobble up fruits & veggies. So yummy! I’m new to Greek yogurt and have been searching for ways to yum it up. Can you still taste how tart the yogurt is? I’m not much of a fan of it plain, but I know it’s super high in protein! Sometimes, simple really is best, right?! 🙂 Your kids sound precious!